The first Big Finish release to use characters from the BBC mega-hit 21st century relaunch of Doctor Who! Jemma Redgrave reprises the character of Kate Stewart as seen on TV in stories such as the globally cinema-screened Doctor Who: Day of the Doctor. 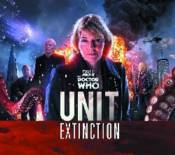 In this four-story box set, Kate Stewart and her UNIT team confront an alien invasion by the Nestene Consciousness and its army of plastic Autons. Also starring Ingrid Oliver as Osgood.